(CN) – A Mississippi nonprofit sued the city of Ocean Springs on Wednesday, claiming its display of the state flag is “racially hostile and demeaning” because of its inclusion of the Confederate battle emblem. Mississippi Rising Coalition and three residents filed the lawsuit Wednesday in Jackson federal court seeking to prohibit Ocean City, population 17,500, from any public displays of the flag. They are represented by lead attorney Carlos Moore with Tucker Moore in Grenada, Miss. The plaintiffs claim Ocean Springs had not displayed the Mississippi flag until a new mayor, Shea Dobson, took office last July. According to the lawsuit, Dodson reversed his decision amid criticism, but the city’s board of aldermen passed a resolution in November requiring the flag to be flown at City Hall and other city buildings. The U.S. Supreme Court in November rejected a flag challenge from Moore, one of two attorneys who filed Tuesday’s lawsuit. Moore, who is African-American, sought to declare the flag unconstitutional under the Equal Protection Clause. 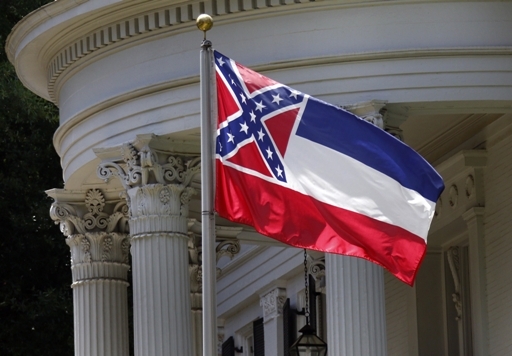 Mississippians voted in 2001 to keep the flag the way it is, but all eight of the state’s public universities have stopped flying the state flag, many since the fatal shootings of nine black people at a church in Charleston, S.C.